As fans hang out of buses, banging their hands on the metal sides, reciting sporting chants, the presence of the World Cup can not just be seen by the new stadiums and infrastructure, but felt in the energy of the atmosphere. In 2018, Russia will host the 21st FIFA World Cup. And this time it's visa-free for everyone! Visa restrictions for all official participants, athletes, referees, coaches as well as visitors, will be dropped before and during the tournament, regardless of citizenship. The tournament will take place across 11 cities in western Russia including the cultural capital, St Petersburg; the historic capital, Moscow; the cities of Yekaterinburg and Kazan; and of course, Sochi, the host city of the 2014 Winter Olympics. So what can you do to start planning your trip? At the moment, full details about the tournament have yet to be released but it’s certainly worth making plans to explore the country and support your national team during an exciting summer in Russia. 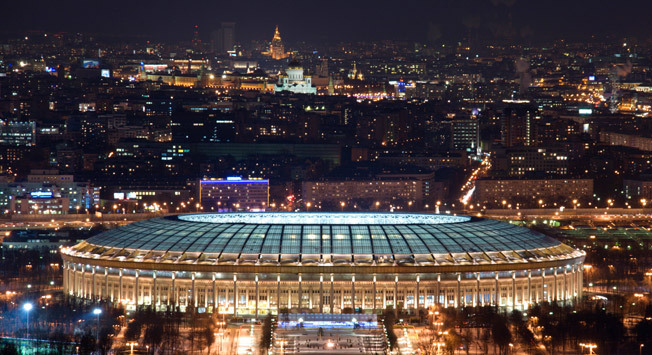 Many tour companies have already opened waiting lists for World Cup travel but we’ve put together some of our own travel tips for a complete tour of Russia in 2018. A trip to Moscow, around the Golden Ring and to St. Petersburg is a must- immerse yourself in the treasures of Old Russia and experience the zenith of modern Russia in its two greatest cities. In Moscow, the grandiose Kremlin and Red Square alongside the vivid colours and intricacy of the onion domes of St Basil's Cathedral is something to behold. After the sights of Moscow, a short trip to the ancient towns of the Golden Ring, will leave you surrounded in relics of Russia’s past. These hidden gems have a lot to offer visitors who can experience the preserved wooden architecture, buy traditional crafts as well as meet the locals renowned for their hospitality. The last stop on your journey will be the Venice of the North, St. Petersburg. From the colourful domes of the Saviour on Spilled Blood, to the grand halls of the Hermitage and Imperial estates, the magnificence of St. Petersburg will take your breath away. If it’s not your first visit to Russia, you will probably be ready to get away from the tourist hot-spots and delve into what local Russia has to offer. Combining such a trip with the World Cup 2018 is perfectly possible. So, if you plan to venture out of Moscow, make sure to check out the options below. There are three host cities in the South of Russia: Volgograd, Rostov-on-Don and Sochi. Each of them with a different atmosphere and local culture. Sochi, the 2014 Winter Olympics host, will certainly catch your eye. Aside from the state-of-the-art infrastructure, the unique natural environment is certain to impress visitors. Where else can you ski in the morning and sunbathe in the afternoon? Sochi offer this and much more such as traditional tea tasting ceremonies, premium Russian banyas and a variety of cultural experiences. Volgograd is famous for its epic ‘Ð Ð¾Ð´Ð¸Ð½Ð°-Ð¼Ð°ÑÑ Ð·Ð¾Ð²ÑÑ!’ (Rodina mat’ zovet) monument. Standing on the Mamaev Kurgan, the Motherland Calls is the tallest statue of a woman in the world and was erected to commemorate the victory of the Soviet army in the Battle of Stalingrad. Volgograd is easy to reach from Moscow by overnight train or plane with direct flights under two hours. Travelling to the East of Russia can feel like a different country as the life and the culture you encounter is so much different from the major cities of Moscow & St. Petersburg. Starting from the magnificent Kazan and on to the point where East meets West in Yekaterinburg, prepare yourself for an exploration into the depths of Russia. Kazan, the capital city of Tatarstan, has opulent palaces, magnificent churches, and a thriving cultural scene. Its hallmark, the QolÅärif Mosque (also known as Kul Sharif Mosque) is one of the largest mosques in Europe. This architectural landmark defines the past, the present and the future of Kazan. Yekaterinburg is one of the most important stops for any tourists venturing this far into Russia. For those interested in Russian history, Yekaterinburg is the sight of one of the excesses of the Bolshevik Revolution- the execution of Tsar Nicholas II and his family. Although the fastest way to get to both Kazan and Yekaterinburg is by plane, travelling on the Trans-Siberian train is an opportunity not be missed. There are regular trains heading east where you’ll travel with locals or less frequent luxury trains with all the amenities of a top hotel. Combine a trip to Moscow or St. Petersburg with Kaliningrad, a small territory of the Russian Federation that is separated from the main body of the country. It lies on the sea and the river between Poland and Lithuania and was once home to Immanuel Kant, who taught at the university. Referring to it by its former name, he remarked, “A city like Konigsberg on the Pregal River is well suited for expansion of both human knowledge and the world.” Enjoy the sunshine on the pristine southern Russian coast and head into the mountains to see the Kurskaya Spit, a UNESCO protected nature reserve. The 2018 FIFA World Cup will be a perfect time to visit Russia. The doors will be open to the those who want to step into Russia's diverse culture. Travel around the west, be part of the most exhilarating sporting event in the world, and experience the interesting cities and sights in the surrounding area. Relax on the beaches of the Black Sea or feel revived by the healing waters of Sochi's sulfur springs. The energy of these cities won’t be matched during the 2018 World Cup.